The dollar remains steady despite weaker than expected US retail sales (Aug m/m 0.1% vs 0.4% f/c/core Aug m/m 0.3% vs 0.5% f/c), as upward-revised data from July signal solid growth in Q3. 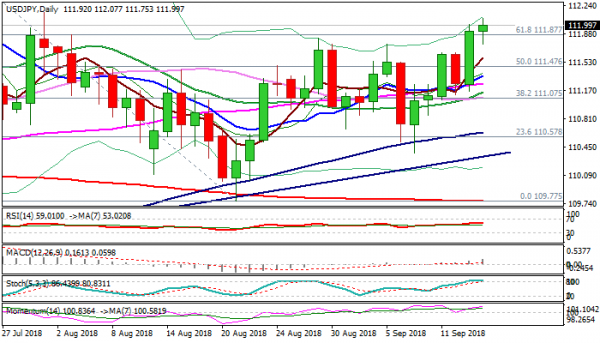 The USDJPY pair retested daily high at 112.07, posted during Asian session, maintaining bullish bias after shallow correction was contained at 111.75 (European session low). 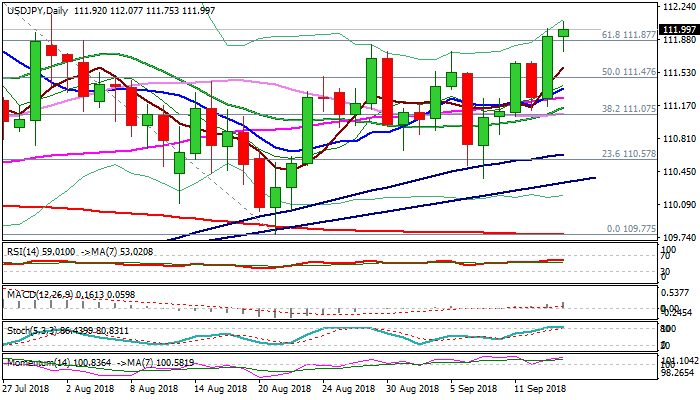 Bulls keep focus at key barriers at 112.15/37 (01 Aug high/Fibo 76.4% of 113.17/109.77) as fears of deeper pullback on pre-weekend profit-taking fade. Close above broken Fibo barrier at 111.87 (61.8% of 113.17/109.77) is needed to confirm strong bullish stance.